Luoyang (洛阳; Luòyáng) is a city in Henan province. Luoyang is in the heartland of Chinese civilisation. It was the capital of several dynasties in Chinese history, most notably the Eastern Han Dynasty, and the state of Wei during the Three Kingdoms period. It was the eastern terminus of the historic Silk Road, and the junction of the three ancient canals that made up the original Grand Canal. The city is on the northern side of the Luo River. The train station is north of the town centre, and Jinguyuan Lu（金谷园路）goes from the station to Wangcheng Square. To the east is the Old Town and to the west the Wangcheng Park. Tourists come here primarily to see the Longmen Caves, the White Horse Temple and Guanlin Temple, which are close to the town, rather than the town itself. Ruined remains of the ancient cities called "Luoyang" are scattered in and around the Old Town area, and some can be visited. 34.7368112.38641 Luoyang Beijiao Airport (洛阳北郊机场, Luòyáng běijiāo jīchǎng, LYA IATA). About 10 km north of the city center. Flights are available from Beijing, Shanghai, Shenzhen, and a few other major cities. Xinzheng airport in Zhengzhou has a much better selection of destinations, and is on a high-speed rail line (but you need to change at Zhengzhou East, and it may not be obvious how to do this). There are two train stations in Luoyang: Luoyang Station (northern end of Jinguyuan Road) and Luoyang Longmen (south of Luoyang). 34.5941112.45272 Luoyang Longmen Station (洛阳龙门站). This station handles all high-speed trains, including high-speed sleepers. Beijing West takes about 4 hours, Xi'an takes about 1.5-2 hours, Zhengzhou takes about 40 min, Shanghai takes 5-6 hours (or 9 hours on the D-class sleeper). There is a direct shuttle bus to Longmen Grottoes leaving from outside the station exit, just past the touts who'd prefer that you not take it. Luoyang has two major bus stations. The main bus station is across the plaza Luoyang train station, at the corner of Jinguyuan Road and Daonan Road. Transportation inside the city of Luoyang is very convenient. There are two kinds of city buses which cost ¥1 or ¥1.5 per ride. The buses offer beautiful scenery all around the city. This is the convenient and affordable way to travel in Luoyang. The taxi start price is ¥5 (includes 3 km), + ¥1.5 per additional kilometer. A metro system is under constructions, with two lines scheduled to open in 2022. 34.5632112.47111 Longmen Grottoes (龙门石窟 (Longmen Shiku)) (On the banks of Yi River). One of the finest Buddhist rock sculptural sites in China and a UNESCO World Heritage Site. 34.7224112.59852 Baima Temple (白马寺; Báimǎsì; lit. White Horse Temple) (12 km east of the city centre, take bus 56). 7:30AM-5:30PM. This is the first officially sanctioned Buddhist temple in China and one of the oldest in the world. It was established almost 2000 years ago but rebuilt many times since. ¥50 (¥25 students). 34.6087112.47733 Guanlin Temple. (关林庙， bus 81 from the train station stops here and then continues on to the Longmen Caves) Commemorating Guan Yu, great warrior of the Kingdom of Shu and main character from, "The Romance of the Three Kingdoms". The temple is built over the mausoleum which houses the general god's head, and contains several halls dedicated to the deified man. The side halls are all under construction. The ticket price is a pretty stiff 50 kuai. 34.64386112.445774 Luoyang Museum (洛阳博物馆), Nietai Road, Luolong District (洛龙区聂泰路) (Bus route 77), ☎ +86 379 69901002. 09:00-17:00, no entry after 16:30, closed on Mondays. Very well done museum featuring an extensive collection of ancient Zhou Dynasty bronzes as well as Han and Tang Dynasty porcelains, nearly all of which were made and found in the area, giving a sense of the former grandeur of the ancient capital. The museum is sparkling and features broad, uncrowded exhibit rooms and efficient air conditioning, making it a good way to beat the summer heat after the Longmen Caves. Even those with only a passing interest in porcelain will be satisfied. Free. Ancient Han Tombs Museum. Fascinating museum with reconstructed and unearthed tombs from the Western Han dynasty to the Northern Song Dynasty. 34.6674112.41445 Wangcheng Park (王城公园). One site of the Luoyang Peony Festival in April, something not to be missed. 34.7057112.45267 Shangqing Gong. 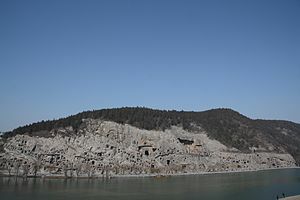 4 km northwest of Luoyang City Mangshan Mountain emerald Yunfeng, was built in the Tang Dynasty, said early laojunmiao. Qian Feng the first year (AD 666), made me as too Xuan Yuan emperor, it is also known as the temple of Emperor Xuan yuan. After avoiding Xuanzong taboo, renamed the Yuan emperor temple, finally changed to the palace. Ancient Store Street (古董街). Luoyang has a long, beautiful with fully functioning stores, a lot like Pingyao, another incredible visit. Shanghai Market (上海市场). A long street where you can find a lot of stuff such shoes (some very cheap), clothes, sports, and DVDs. All along the street there are mini malls at both sides of the street where you can find endless stuff such as electronic devices, mobiles, clothes, accessories, and packages. Walmart (沃尔玛) (In front of Shanghai Market). Many western products. Wanfuqin. A big mall like any you can find in Europe. Qianjude Peking Duck Restaurant. Famous for duck of course, but has many other delicious entrees. Dirty Street, Guangzhou Shichuang. 24/7. This is not so much a restaurant as it is a dirty street where they sell barbecue and other foods 24 hours a day. In daylight hours it doubles as a spice market, at night there are more food options, and after midnight it is the best option for late-night meals in all of Luoyang (though the city does have a few all-night McDonalds [Shanghai Shichuang], a 24-hour KFC [Wangfujing], and a steak restaurant that never closes [xinduhui] as well as various street vendors). The barbecue here is not the best in Luoyang, but it is better than what you'd find in many other cities. Adventurous eating is recommended: local favorites are sheep eyes, kidneys, and testicles. Throughout the day a large number of people eat here so the meat is generally very fresh, and the meat is cooked over an open flame so don't worry about food poisoning, but it's essentially a dirty street where drunk people go to eat spicy, greasy, salty food before they go home. Awesome food. Nobody speaks English here, but the vendors are accustomed to foreigners so just point at what you want and they will cook it for you. cheap. In Luoyang you can find a huge selection of restaurants, but there are not so many bars and clubs. If you want to drink baijiu (strong liquor based on rice) you should go to a restaurant, because clubs do not carry it. Aipai (Third floor of Xinduhui Commercial Center). Close about 2AM. They also have private rooms and it is quite big. They have live music, dancing, gogo girls and the cocktail guys' show is really nice. Full bar with a nice cocktail selection. Art Bar, Zhujiang South Road. This is not for dance but for drink. They have many tables and a second floor with private rooms and a pool. They have many artists that sing and play live music from 9:30PM. Full bar plus popcorn or fruit. On the same street there are a few bars, all of them with live music and a variety of drinks. Come Bar (Near Shanghai Market). Private minirooms popular with couples. Romantic or slow music. You can drink, have an ice-cream or eat something. Lanmei, Nan Chang Road. Close about 1:30AM. Disco where you can drink beer, vodka, rum or many other spirits seated at a table. They also have private rooms with karaoke. At 10PM they start to play music for dance. It has a bouncing floor so you can follow the rhythm easily. They have gogo girls that dance 5 minutes every hour more or less. Mirage Bar (Near Shanghai Market, on the same street as Walmart). A quiet bar where you can talk and drink. Full bar. New Paradise (3rd floor of Xindouhui). Taiwanese owned bar. Good mix of expats and Chinese. Extremely cute and intelligent staff, good food and cheap beer. Say "hi" to the beautiful Rebecca! Luoyang Yijia International Youth Hostel, No.329 zhongzhoudong Road, in the opposite of Qingnianggong square, next to the church, ☎ +86-0379-63512311, e-mail: lyhostel@hotmail.com. Check-out: before 12AM. Luoyang Yijia, located in the center part of China’s ancient capital Luoyang, is a special and well-equipped hostel with its own cultural background features and art taste. There you will get the chance to meet people from all over the world and make friends with various travellers. There are five kinds of available rooms: Private Twin Room, Double Bed Room, Triple Room, Family Room, and Dorm. All of them equipped with air conditioners and the former four type rooms also enjoy its own bathroom and TV. For the Dorm, the hostel provide guests with public bathroom. ¥40-180. Luoyangmingyuan Youth Hostel, 20 Jiefang North Road (About 5 minutes walk from the railway station), ☎ +86 379 63191269, e-mail: lymingyuan@163.com. Check-out: Noon. A nice hostel that looks very much like a hotel. Clean rooms with air conditioning and breakfast included. Dorms ¥50. 34.655742127535112.368807792661 Luoyang Jujia Hostel, Qiaonan D Section, Longlin Road, Jianxi District, ☎ +86 158 37906577, e-mail: tld316@hotmail.com. Check-out: noon. Not a hostel per se but more a homestay in a clean, well organised private apartment. The neighbourhood is a real, non-touristy and friendly area with a lot of atmosphere to explore in the day and in the evening (local restaurants abound, including franchises such as Mr. Lee 10mins walk north on Xiyuan Rd). Rooms with shared facilities (hot water shower) and free Internet/WiFi. Guest kitchen, washing machine, safety box and café available. The owner is a very nice person with generous coffee but his English is very basic. It is located somewhat from the train station (40 min by bus ¥1, 15mins by taxi ¥19) but do not try to find it alone, the owner or his son will kindly pick you up. If visiting during the winter be prepare for the cold night because there is not an ambient heater. However the owner will provide you with a comfortable heated blanket which will be more than enough for a nice evening sleep. Twin rooms from ¥70. 34.662440308026112.376088507082 Renhe Hotell, Xiyuan Road, beside the Oriental Hospital (About 10 mins by taxi from the railway station), ☎ +86 379 64278936. Check-out: Noon. Simple 2-star, a great non-touristy location in west Luoyang. Clean rooms with air conditioning. Easy access to old town by bus 8. Room ¥78-108. Luoyang International Hostel, Binjiang office Building, 72 Jinguyuan. Nanyuan Express Hotel (洛阳南苑快捷酒店; Luò​yáng​ Nán​yuàn​ Kuài​jié​jiǔ​diàn​), South end of Nanchang Road, Jianxi District (涧西区南昌路南段231号; Jiàn​xī​qū​ Nán​chāng​lù​nán​duàn​). Rooms with free internet and electric kettle. Ticket office, fitness and massage available. Listed rates for doubles from ¥198, discounted from ¥130, including breakfast. Luoyang Xiaolangdi Hotel (洛阳小浪底宾馆; Luò​yáng​ xiǎo​làng​dǐ​ Bīn​guǎn​), South end of Nanchang Road, Jianxi District (涧西区南昌路南段; Jiàn​xī​qū Nán​chāng​lù​nán​duàn)​​, ☎ +86 379 64946688, fax: +86 379 64946288. Three-star hotel with rooms with free internet. Business center, gift shop, ticket office, billards and fitness available. Chinese restaurant. Listed rates for doubles from ¥380, discounted ¥218, breakfast ¥15. Luoyang Shendu Hotel (洛阳神都大厦; Luò​yáng​ Shén​dū​ Dà​shà​), 168 Huangmei Road, Xigong District (西工区黄梅路168号; Xī​gōng​qū​ Huángméilù), ☎ +86 379 63485088, fax: +86 37962560866. Three-star hotel with large rooms with free internet. Business center, ticket office, table tennis, fitness and massage available. Chinese restaurant and room service. Listed rates for doubles from ¥480, discounted from ¥228, including breakfast. [dead link] Lee Royal Hotel Mudu (洛阳钼都利豪国际饭店; Luò​yáng ​Mù​dūlì​háo​guó​jì​ Fàn​diàn​​), Middle section of Kaiyuan Avenue, Luonanxin District (洛南新区开元大道中段; Luò​nán​xīn​qū​ Kāi​yuán​dà​dào​zhōng​duàn​), ☎ +86 379 65979999, fax: +86 379 65923393, e-mail: leeroyalhotel@126.com. Five-star hotel with rooms with free internet. Business center, currency exchange, gift shop, beauty salon, ticket office, table tennis, fitness, tennis and indoor swimming pool available. Chinese and Western restaurants as well as coffee shop and bar. Listed rates ¥1,088-1,980, including breakfast. Luoyang Dongshan Hotel (洛阳东山宾馆; Luò​yáng​ Dōng​shān​ Bīn​guǎn​), Dongshan, Luolong District (洛龙区东山; Luò​lóng​qū​ Dōng​shān)​, ☎ +86 379 64686000, fax: +86 379 64686001. Rooms with free internet. Business center, currency exchange, gift shop, ticket office, billards, table tennis, fitness, tennis, basketball, indoor swimming pool, massage and water sports available. Chinese and Western restaurants as well as coffee shop and bar. Listed rates ¥880-1,580, including breakfast. Beijing is 3.5-4 hours away by high-speed rail or 7-11 hours by sleeper train, Shanghai is 8-10 hours away by high-speed sleeper train, and Xi'an is 1.5-2 hours away by high-speed train or 4-5 hours away by slow train. It is possible (although gruelling) to arrive from Beijing or Shanghai by overnight train, visit the Longmen grottoes and possibly one or two other sights, then continue to Xi'an in the space of 1 night and a day. This city travel guide to Luoyang is an outline and needs more content. It has a template, but there is not enough information present. Please plunge forward and help it grow!